Recently, (somewhere in between wolfishly tearing through self-improvement books and multiple failed attempts to curb a sugar addiction), I designed these mini lip-shaped notecards. The seemingly ubiquitous 'lips' motif, sported in many a fashion collection these days, finally snagged me and, as trends have a tendency to do, refused to let go. And so I was hopelessly compelled to design these little smoochies. Well, they are pretty freaking cute, aren't they? It's as easy as pie to make: Download, Print, Cut. Fold. Write a fabulous message inside. Oh, and I've also included gift tag versions as a bonus. Mwah! Just felt like showing off my fabulous hand-carving efforts with this heart-shaped stamp I made recently... Took a few attempts to get it right but I got there eventually! Super-cute Japanese stationery. Can't get enough of it. Pink. The colour, not the recording artist. iPhone/iPad wallpaper from here and here. Pretty + colourful tech accessories- got a real thing for them at the moment. This cute-as-pie craft book from Hello Sandwich! Children's toys, books and clothes. Basically, I'm a big kid. My workspace and all my creative and colourful clutter- it's amazing how an inspiring environment can boost your creativity! Do you ever look at some of the awesome work out there and think- wish I'd thought of that!! I do this on a daily basis with EVERYTHING on Minieco. Kate's D.I.Y projects are always ridiculously stunning and this Valentine's Day holiday is no exception... If you haven't already, you should check them all out here. These cutie-patootie cards I created may be a tad last minute for Valentine's Day. But hey, romantic gestures don't need to be reserved merely for the holidays. All you need is a printer, good quality white card stock, patterned masking tape and a mini pink (or red) colour pencil. READ ON to download your freebies! With Valentine's Day just around the corner, I thought I'd revisit some of my old Valentine's Day DIY projects from previous years...just in case you missed it, or simply felt like taking another peek! Most contain free stationery printables to help you re-create the project for yourself. DIY 'Je t'aime' coffee cup wrappers - Wouldn't it be cute to surprise a loved one on Valentine's morning with a cup of coffee for the road that literally says 'I love you'? 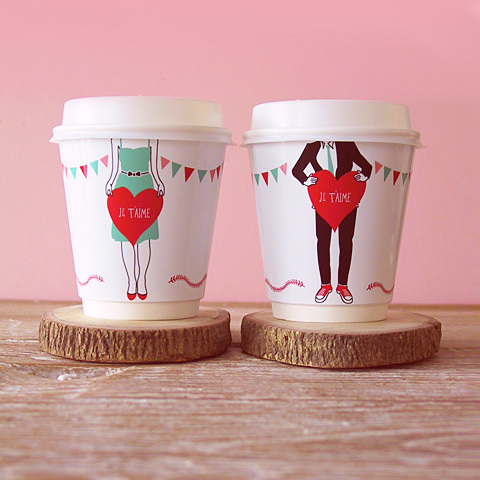 With this concept in mind I designed these love-themed wrappers that can be used to dress up a disposable coffee cup. The perfect romantic gesture for the caffeine obsessed! DIY 'Je t'aime' mini card sets - I really enjoyed creating the design for the 'Je t'aime' coffee cup wrappers' so I thought I'd also transform them into mini cards with polka dot lined envelopes. DIY Valentine Post-it Love Notes - To elicit a smile or two from your loved one on Valentines's day, try writing sweet little messages on post-its and leave them in unexpected locations for your partner to find. DIY Origami Heart Love Note - Create an origami paper heart and write a private message to a loved one inside. DIY Valentine Popcorn Invitation ( for a cosy night in ) - Instead of splurging on dinner at a fancy restaurant, have a cosy night in on the couch. A couch 'picnic' of sorts. Snuggle under a blanket, order take-out, indulge in champagne, popcorn and candy in front of your favourite romantic movie. 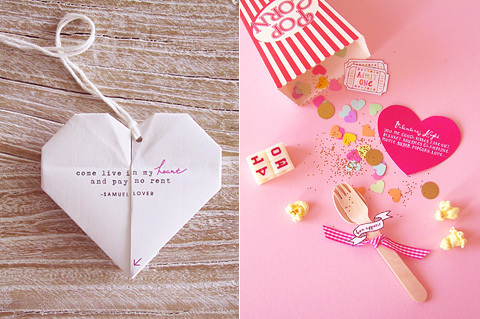 Download the bits n' pieces to re-create this 'popcorn' invitation to give to your loved one. 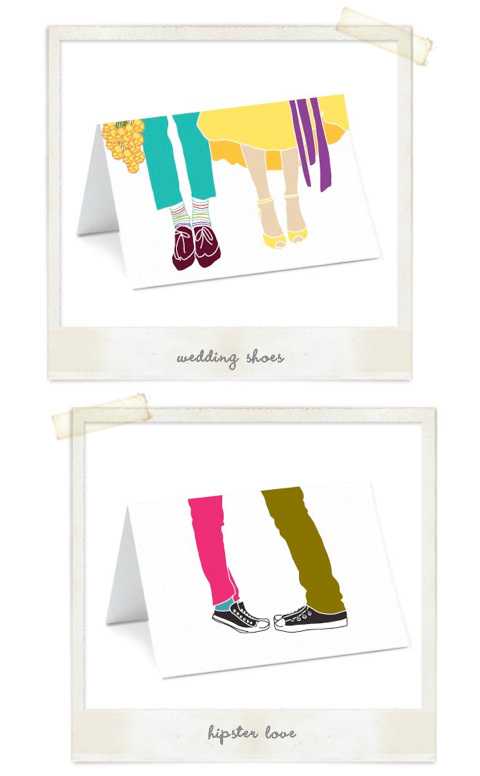 Cute greeting cards by Rubina. Continue to download your freebies! Wouldn't it be cute to surprise a loved one on Valentine's morning (or any morning for that matter) with a cup of coffee for the road that literally says 'I love you'? With this concept in mind I designed these love-themed wrappers that can be used to dress up a disposable coffee cup. The perfect romantic gesture for the caffeine obsessed! It comes around once a year. Instantly detectable from the overwhelming explosion of pink and red in shop windows, the hiked up price tag on a bunch of roses and the sudden inexplicable desire to buy chocolates or candy. The experience may be nauseating to many, but, in my opinion, the perception of Valentine's Day merely being expensive and fraught with clichés belongs to those who fail to think outside the heart-shaped box. The truth is, I bear little objection to the holiday. In fact, I embrace it and view it as an opportunity to get creative! Love this pretty, illustrated Valentine postcard series from Studio Tipi. They're inspired by 'myths, folklores and ancient stories from around the world' and 'based on the theme of undying love'. Sweet. 05 Rainbow ballpoint pens from Kikkerland. 07 Heart stamp as part of Valentine's Mailing Set at Cavallini and Co.
Yeah, I know, Valentine's day is over a month away and yes, I'm jumping the gun a tad. But I got excited when I found these cute handmade cards by Lisa Jones and just had to share... You forgive me right? Valentine's Day may be over but I'm sure you can find other excuses to use this gorgeous "Love Mail" stationery by Kikki K. Also worth checking out are their "Bon Voyage" and "Bundle" collections. Sigh... I had all these plans to create a plethora of DIY Valentine's Day projects for Eat Drink Chic. However, plans for my impending engagement party have taken up so much of my time that I've had to put these ideas on hold. A few days ago I created these little origami heart invitations for our engagement. They open up to reveal the invitation message inside and have an attached string so that guests can also use them as a keepsake decoration. They also sit snugly in little translucent paper pockets with sewn edges. However, in a last ditch effort to get at least SOMETHING up for Valentine's Day (as last-minute as it may be), I've removed the invitation text and provided them for you to download to write a little love note to your Valentine. In fact, you could even use this to surprise your significant other at any time of the year with an unexpected love message. Continue to read more about the project and to download your freebies!